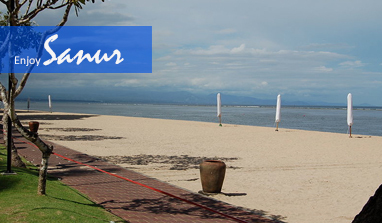 Aquarius Beach Hotel is located in the hearth of Sanur within easy walking distance to Sindhu Beach. Its 16 rooms feature a modern minimalist style with natural teak wood, a cozy lounge and sundeck overlooking the swimming pool and lush gardens, all designed to provide our guests peace of mind and a totally relaxing stay. Aquarius Beach Hotel, your private paradise, filled with beautiful experiences. Sanur offers gleaming white sands that extend as far as the eye can see, and abounds with restaurants, art and craft shops and Balinese culture. Ceremonies are a daily occurrence here, with the local peoples’ strong adherence to Balinese traditions and culture. Removed from the hustle and bustle, Sanur offers a different style of holiday. A feeling of friendship and sincerity enables you to feel the personality of the Balinese people. Recommended spots to visit in and around Sanur are Sindhu Beach, Museum Le Mayur, Denpasar Art Centre, Sindu Traditional Market, Turtle Island in Serangan, and more. A place to start your journey in the island of the gods.